Michael Harner, Ph.D., is an anthropologist and founder of the Foundation for Shamanic Studies, an international nonprofit organization dedicated to preserving shamanic knowledge as it survives on the planet and to teaching the basic principles of that knowledge for practical applications in the contemporary world. Harner, who has practiced shamanic healing since 1961, received his doctorate at the University of California-Berkeley. He is a former professor and chairperson of the department of anthropology at the Graduate Faculty of the New School for Social Research in New York, and has taught at Columbia, Yale, and UC Berkeley. He also served as co-chair of the anthropology section of the New York Academy of Sciences. His books include The Jvaro, Hallucinogens and Shamanism, and the classic The Way of The Shaman. Mexico, Peru, the Canadian Arctic, Samiland, and western North America. Alternative Therapies interviewed Harner at his office in Mill Valley, California, during an intense storm. The word "shaman" in the original Tungus language refers to a person who makes journeys to nonordinary reality in an altered state of consciousness. Adopting the term in the West was useful because people didn't know what it meant. Terms like "wizard," "witch," "sorcerer," and "witch doctor" have their own connotations, ambiguities, and preconceptions associated with them. Although the term is from Siberia, the practice of shamanism existed on all inhabited continents. After years of extensive research, Mircea Eliade, in his book, Shamanism: Archaic Techniques of Ecstasy, concluded that shamanism underlays all the other spiritual traditions on the planet, and that the most distinctive feature of shamanism-but by no means the only one-was the journey to other worlds in an altered state of consciousness. Shamanism is also not exclusionary. They don't say, "We have the only healing system." In a holistic approach to healing, the shaman uses the spiritual means at his or her disposal in cooperation with people in the community who have other techniques such as plant healing, massage, and bone setting. The shaman's purpose is to help the patient get well, not to prove that his or her system is the only one that works. a medicinal one and a spiritual one. From the shamanic point of view, people who are not powerful-spiritually "power-filled," that is-are prone to illness, accidents, and bad luck. This goes beyond our normal definition of illness. The shaman restores a person's linkage to his or her spiritual power. This spiritual power is something analogous to a spiritual immune defense system, but I wouldn't make a one-to one equivalence. It's an analog. The power makes one resistant to illness. If somebody is repeatedly ill, then it's clear that they need a power connection. A healthy person who is not sick might go on a vision quest to get this power connection, but one of the shaman's jobs is to help people who are in no condition to do that for themselves. Today in our culture many consider it avant-garde if a person talks about the mind-body connection, but the fact that the brain is connected to the rest of the body is not the most exciting news. It's been known for hundreds and thousands of years. What's really important about shamanism, in my opinion, is that the shaman knows that we are not alone. By that I mean, when one human being compassionately works to relieve the suffering of another, the helping spirits are interested and become involved. When somebody who is disinterested, who is not an immediate family member, out of generosity and compassion helps somebody else to relieve illness or pain and suffering-and it works even better when there are two or more shamans involved-this is when miracles occur. So the big news shamanism offers is not that the head is connected to the rest of the body, but that we are not alone. Santa Fe, NM, years ago, women who had had significant childhood abuse would mention in the course of the sessions that they had removed themselves psychically from the situation at the time of abuse. Sandra immediately recognized, as a practicing shaman, that the person's soul to some degree had left the body (if it had left completely, the person would have been dead), and therefore the logical thing was to retrieve the lost portion of the soul and bring it back. So she then started doing soul retrieval for these people who had had significant childhood traumas, and the results were astounding. Today, this work is an important part of shamanic healing practice in the West. Is this your work my Lady...? Yes, my dear Mahabaratara. Copy and pasting is easy. I started the Pudding Palace, but the PP may be chucked if the Admin wakes up in a bad mood. That's why we want to back up the good stuff, just in case. No worries about losing Uri/Dice's wonderful posts. In about 90% of the world, the altered states of consciousness used in shamanism are attained through consciousness-changing techniques involving a monotonous percussion sound, most typically done with a drum, but also with sticks, rattles, and other instruments. In perhaps 10% of the cultures, shamans use psychedelic drugs to change their state of consciousness. To get back to the extraction technique: the technique involves an altered state of consciousness and seeing into the client's body. Much shamanic work, including journeying and extraction, is done in darkness for a very simple reason. The shaman wishes to cut out the stimuli of ordinary reality- light, sound, and so on-and move into unseen reality. The shaman learns to look in the body with "x-ray vision" and see the illness and its location, and then to extract that illness. Depossession is related to extraction but it's not the same thing. From a shamanic point of view, it's very important to get out of the Middle World when journeying for spiritual purposes. In the old days, shamans journeyed in the Middle World to see how relatives were doing at a distant place or to locate the herds of migratory animals. But most of our work today is in the Upper and Lower Worlds where shamans have voyaged since ancient times. Shamans often prefer not to draw on the spirits of the Middle World because many of them are confused and lacking in power. Going to the Upper or Lower Worlds, one reaches spiritual beings of compassion, power, and wisdom. Shamans who do another type of healing help the dead as well as the living. These shamans are called "psychopomps," or conductors of souls. Remember, from a shamanic point of view, when you're comatose, you're dead. So the shaman, in the case of comatose persons, would seek them out and see if they wanted to come back. Shamanism is not a system that intends to keep people in this ordinary reality whether they like it or not, because the shaman knows that this is not necessarily the best reality. You make the journey for the person who is comatose to find out what they want. If they want to come back, then the job of the shaman is to bring them back. But if they want to go on- or, more commonly, if they're dying or already dead-then the job of the shaman is to get them to a place where they will be content and not have them stay here, adrift in the Middle World. So now we come back to this business of depossession. Most cases of depossession of humans are by other humans who are dead, who are here in the Middle World and don't know they're dead. If people are disempowered, or have soul loss or power loss, they are like a vacuum into which these confused entities can come. This is involuntary possession. Shamans will conduct the entity-with its permission once it realizes it's dead-to a place beyond the Middle World where it will be reunited with people who it loves. Once this is done, so that the clients are no longer possessed, shamans restore their full soul and lost power connections so they are again whole and not vulnerable to further possessions. In your opinion, why don't we do that now? Unfortunately, when science started, partially as a reaction to the church in Europe, it ordained that souls and spirits have no reality and therefore could not be considered in scientific theory. Now that's an a priori position; in other words, ironically, a statement of faith enunciated in the 18th century. In fact, science has never disproved the existence of spirits. I would submit that now, on the edge of the 21st century, it's time to stop having a science that's based on faith (the faith that there are no spirits) and make it real science, which means that it doesn't ordain a priori that certain types of causes cannot exist. Among the Untsuri Shuar and Jvaro people of eastern Ecuador, with whom I lived for quite a while, they call these intrusions "magical darts." There were many feuds and wars, and sometimes healers would get angry and lose their discipline and use their powers to get even. But it is important to know that this is a big mistake, not just ethically, but in terms of self-preservation. No matter how justified a person feels emotionally at the time, those spiritual beings who are representative of the great, loving, hidden universe will disconnect. It's like we're rechargeable batteries. We still have some power, and we can do damage, but the power source is no longer charging us. I've seen this many times in the Amazon. The shamans, in their anger, do harm for awhile, but eventually everything they send out comes back in on them, and it often results not only in their own death or pain, but their immediate family gets affected disastrously by it. This doesn't mean you shouldn't get angry at people. It just means that you should have discipline and know there are parameters. You can get angry with somebody and verbally let out steam and, at the same time, control your spiritual side. But for your own self-preservation, if you don't work to relieve pain and suffering-and especially if you work in a contrary way-you're soon out of business, and probably dead. and then that wholeness and power heals whatever is wrong with that person. So in this framework a power-filled person has the ability to heal himself. To an outsider, it would look like they're healing themselves. But the concept of self-healing excludes the spirits. From the shamanic point of view, nobody's lived into adult life without spiritual help, whether they know it or not. The self-healing concept is a secular concept, and that's fine as far as it goes. It teaches people to take some responsibility for their illness. But it also teaches them to take responsibility for their death. With that approach, everybody's a failure at the moment of death, because they are responsible for the whole thing. From a shamanic point of view we are not that important. We are not necessarily the biggest thing in the universe. The shaman has a more humble point of view, that there is what looks like self-healing but, in fact, we are getting help. And the shaman has the role, of course, of accelerating that possibility. They might be in a specific case. I don't want to rule that out. Self-healing is a very secular view of reality, but it's a step in consciousness. It's like recognizing the brain is connected to the body. especially regarding the implications for medicine? The terms "ordinary reality" and "nonordinary reality" come from Carlos Casteneda. Ordinary reality is the reality that we all perceive together. It's the reality in which we can all agree that there is a clock on the wall. Nonordinary reality is the reality that is associated with the shamanic state of consciousness; that is, when the consciousness has been altered and you're able to see what you normally don't see in an ordinary state of consciousness. Ordinary reality is something that virtually everybody agrees on. Nonordinary reality is very person-specific. The information obtained in nonordinary reality is tailor-made to the individual-other people may not perceive it at all, as opposed to the information obtained in ordinary reality, in which everybody gets the same thing. Nonordinary reality is also an empirical reality; that is, the person interacts with it, sees it, touches it, hears it, feels it. And the shaman sees with the heart in that reality. In nonordinary reality, for something to be the same for different persons, it has to be the same in the heart. Here (in ordinary reality) for something to be the same it doesn't matter what your emotion is; you'll see it, for example, as a door in the room. If I showed you a picture of my mother, now deceased, you and I would not have the same emotional relationship with that picture. But if I said the word "mother," and everyone saw their own mother, the emotional feeling in the heart would be closer-not identical, but closer. So to see things exactly the same in the heart, they have to be a little different for each person, because each person has a different personality and a different life history. The term "nonordinary reality" is useful because it permits one to be reminded that access to these worlds is related to the degree to which you have entered the shamanic state of consciousness. It clarifies our thinking. For years, many people were confused by what shamans said. "I made a journey and was away for 3 years, and such and such happened." Now that person in nonordinary reality had the experience of living somewhere else for 3 years, but might have been gone only a half-hour in ordinary reality. Starting next year, we will be moving forward on this project with some of our most advanced students. I'm not in a position to comfortably start sharing this information publicly-it's too early-but it does involve a real awareness of the spirits. Your interest in miracles was obviously spurred by your experiencing or witnessing miracles. Would you be willing to tell us a miracle story? This example alone doesn't prove anything, but it's these kinds of coincidences that build up in your own practice. In no single case can you be sure what actually happened, but if you find a high correlation between treatments by people who are well known as healing shamans and recoveries- when other things have failed-then you begin to pay attention. When you start shamanic journeying, if you're the kind of person the spirits feel compassion for and want to help, you're going to get lots of teachings you never asked for and never expected. Because once you go through those doors-whatever those doors are-the spirits will teach you according to your preparation, and your life will change. Even one journey may start changing your life. Magic, "Haamana", was a separate venture, and not even restricted to the Tahu'a. A Tahu'a was expected to be skilled at it, but non-Tahu'a could sometimes do it as well. In fact a fisherman was expected to know the rudiments of "fishing magic", for example--forms of magic associated with one's profession were normally wrapped into that profession's skill set. ..... I notice when I put energy/magic into a place, and I return to that place and charge it with energy again and again, the magic seems to build and stays there, and this can be done anywhere. No alters or magic tools necessary. The main thing that set a Tahu'a apart from others wasn't magic, though, but KNOWLEDGE. ..... Ciggy is the closest thing to a Tahu that we've got. ...... Very well put, and I'm glad we left the right brain left brain debate at the Pudding Palace ...... like Ciggy said, "It's like trying to fly a plain with one engine down." Very interesting. I actually believe that 'we' are magical beings and do not need altars or rituals. Everyone is capable of healing and thats another thing I find difficult to accept is why people charge for healing. It is a gift from spirit and should be passed on. What kind of Shaman is Terence McKenna? 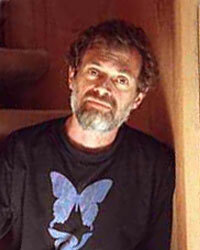 Terence Kemp McKenna (November 16, 1946 – April 3, 2000) was a writer and philosopher. He was notable for his many speculations on subjects ranging from the Voynich Manuscript to the origins of the human species to Novelty theory, which claims time to be a fractal wave of increasing novelty, which culminates dramatically in 2012. His concept appeared to involve a combination of hallucinogenic chemical agents, Gaianism, and shamanism. I actually believe that 'we' are magical beings and do not need altars or rituals. Everyone is capable of healing and thats another thing I find difficult to accept is why people charge for healing. It is a gift from spirit and should be passed on. Do we need the outward forms of religion? That's what alters and magic equipment are. Maybe money jinxes real magic. I find difficult to accept is why people charge for healing. It is a gift from spirit and should be passed on. If a healer used herbs, then pay them for the herbs. If they used energy, pay them in energy. Terrence agrees with you in his last interview above. One time the Tahu'a Rahi told me: "The best way to remember something is to assign energy to it. With energy attached to it, the thought will always be there, in the place of energy, where you assigned it. If you put it on paper, you can lose the paper, but you can never lose the energy." It's interesting, too, to see how people apply this technique accidentally: if something is funny, for example, it's easier to remember because of the energy of the humor! Yes. When there is an emotional element present, the experience is enrichened and increased. And it will stand out in your memory. Or the energy of music brings back what you were thinking about when you first heard the music. I once asked the Tahu'a Rahi if I should follow the Polynesian path and be like them, and he told me: "Your people have a tradition too, people who were like us before they followed the ways of the Farani. When you find that tradition, you'll be more like us and more like yourself, at the same time." That launched my research into pre-Christian European traditions: Druidry and Asatru. It was all very familiar with what I'd learned from the Tahu'a Rahi, but in "European terms", you might say, expressed in ways fitting to our ancestral memories. Yes. He refers to something which is universal; the growth in knowledge, being and understanding. From the point of view of God no traditions/ways/schools exist. Only qualities of material. Gurdjieff is for real. But following him or another teacher in his footsteps is difficult. Because great demands will be made of you. Only those willing and able to meet the demands (= really to learn to make demands of oneself) can benefit from this teaching. Those that expect something for nothing (no effort on their part) will get nothing. Though, (he he) you're an anarchist. Do you believe that "everybody's equal" and there is no hierarchy of levels ? Gurdjieff's teaching is all about levels. And, it is also wonderful to observe/verify the growth - or ascension from a lower level to a higher one. If it's a good school this is also bound to take place. Learning - in the fullest possible meaning of the word. Can you tell me something more about this Tahitian/Polynesian Tahu'a Rahi? interesting. What is your personal belief regarding demonic possession? I'm talking about the really heavy stuff. Or was it a "bad spirit" in a house? There's a priest in Sweden who's a specialist in this. He's very popular and has chased away many hundreds of bad spirits. Ghosts I can explain. And angels. And voodo/juju and most kinds of magic. But I can't really explain demonic possession of the most severe kind. Independent invisible evil entities that enter and possess people? BB ... I'm interested in this, too. I just did a search of posts by Maha, a great regular poster friend of Ciggy's, because he talks about incubus and sucubus. I haven't found the exact post yet. Maha has started his own Ballroom topic, "'This book very precisely encapsulates my theories," and I'm sure he is interested in talking about this on other topics in the Oracle, as well. I'm just trying to help with the exchange of info. Hope this helps. I've contacted a Shaman and we are going to meet at Cyotes. I'm going to take perfect notes, and he will dictate to me to spread his knowledge here. Does anyone have the experience of your body jerking really hard? This happens to me when I'm in between dreaming and waking. He told me this is my body jerking back from astral travel. yes, my body that to. I was aware that it is the astral body moving back into the physical body. It can be very powerful too!!!! perform a variety of ceremonies for the community. Shamans have taken on many roles in tribal communities. They have acted as healers, doctors, priests, psychotherapists, mystics, and storytellers. on an emotional or physical level. When I was doing the research for my book Soul Retrieval Mending the Fragmented Self I found that most shamanic cultures around the world believe that illness is due to the loss of the soul. cause soul loss in one person might not cause soul loss in another. point of impact is in my body. My psyche could not endure that kind of pain. So our psyches have this brilliant self protect mechanism where a part of our essence or soul leaves the body so that we do not feel the full impact of the pain. psychology we don’t talk about what disassociates and where that part goes. In shamanism we know that a piece of the soul leaves the body and goes to a territory in what shamans call non ordinary reality where it waits until someone intervenes in the spiritual realms and facilitates its return. person, or doesn’t know the trauma has passed and it is safe to return. alternate realities and return it to the body of the client. substances, food, relationships, work, or buying material objects. forms for material gain that person must be suffering from soul loss. planetary soul loss today as you watch how we behave towards each other and the rest of life. retrieval within three days after a trauma occurred. even more looking for lost soul parts. young we are unaware of the unconscious patterns we are living out due to our first soul loss. We are always trying to retrieve our soul. And how we do this is by repeating the same trauma over and over again. The names might change of the people involved in our life story, but the story is often the same. them. For some memories of the past traumas might be triggered bringing up a variety of feelings that must be worked through. And for some people the effects are too subtle to notice a change until further work to integrate the soul is done. the soul retrieval would be the beginning of the work. children home and she wants them home now. It is time to come back home again and take our rightful place on the earth. It is our birthright to fully express our souls and create the world we want to live in. And it is our birthright to shine as brightly as the stars above us. It is time to share our light again in the world. You are disturbing peoples (false) thoughts, that's GREAT! My, just wanted to let you know that you got endorsed a second time by a real scientist. Sounds right, the people from a few hundred years ago were smarter because they observed things around them and how they worked, now a days, they just theorize about stuff and don't really think about reality. So only people on the edge of consciousness(which is very few) these days are thinking about how things really are and how they work... You don't need a special degree in anything to become an expert in that subject, in fact, the degree would probably limit your ability to excell in that field because of the education will box your thoughts in... "